Commercial Roofing Cape Coral | JKS Construction & Inpection Inc.
Commercial roofing needs differ greatly from residential roofing needs, and it’s important that your business hire a roofing contractor that understands that. At JKS Construction & Engineering, Inc., we are highly skilled in the commercial roofing industry and can provide your company with expert roofing services that are tailored to the specific needs of your business. Single-ply roofing is a cost effective commercial roofing option that consists of a single ply of waterproof membrane. Typically, reinforcements like polyester, fleece, or felt fabric backing are used. It’s not suitable for all commercial projects — single-ply roofing works best for low slope jobs. Metal roofing has been used in commercial applications for many years. We offer metal roofing options for businesses to help them take advantage of the longevity, durability, and flexibility in design that metal roofing has to offer. Metal roofing can also be a more cost-effective option for companies on a tight budget. Built-up roofing is just as it sounds — it’s a combination of asphalt felts and bitumen that are built up layer by layer. 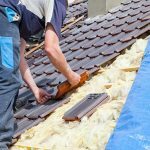 This type of roofing system has been used for over 100 years, and have a high resistance to inclement weather and leaking. Modified roofing is a type of low-slope roofing that exist in two different types. The type chosen depends greatly on the project at hand and what the specific needs of the business are, and both types are designed to contract and expand with building movement. The rolls of material used for modified roofing are manufactured in a factory, ensuring the highest quality control. Get a Quote for Your Commercial Roofing Project Today! At JKS Construction & Engineering Inc., we take commercial roofing seriously. You can trust our team to deliver consistent, quality results and excellent customer service both during and after your new roof installation. Contact us today for a quote by calling 239-283-6054.